The first sign of trouble was at 6:53 p.m., when double train 43 completed the climb to Boulevard Barbès station with heavy smoke pouring from one of the motors on its front car, car M202. The train passengers were evacuated onto the platform and its shoes were lifted from the third rail to cut off the power, whereupon the burning subsided. But with the station full of annoyed passengers, the staff now focused their attention on restoring service. That meant moving the train, and there was no siding before the line descended back into the tunnel. And the fatal decision was made to lower the shoes and move it under its own power, when in fact the motor had not simply overheated, but had a short circuit. Train 43 left the station at 7:05 p.m. amid a cloud of black smoke, but before it had passed two stations, the fire on car M202 had reignited with greater intensity. Unaware of the severity of the situation, the driver kept the train moving until it was back in the tunnel, and only then stopped for help at the first station (Combat, now Colonel Fabien). Again the shoes were lifted and the burning stopped—and again power was reapplied, and the fire restarted. And this time the wooden paddles used to lift the shoes were consumed. The driver was still focused on moving the train off the line, but clearly it could not be driven from the front, and there was no way to electrically disconnect the motor cars and drive it from the rear. So he now asked for a push. By this time the passengers waiting at Barbès had boarded the next train (single train 52), which had then advanced as far as Rue d'Allemagne and was waiting for the signal to continue. It was now unloaded in turn onto the platform there and driven to Combat, where it coupled onto the rear of train 43. At 7:32 p.m. the triple train began moving slowly forward, powered by a single motor car and with the short circuit on the front car M202 still live and feeding the fire. Meanwhile the following train (train 48, another single train), advanced to Rue d'Allemagne and the passengers from trains 43 and 52 crowded onto its four cars. The combined train 43-52 next passed Belleville station. At this station there was a siding, but the failed train could not be put into it; it would have to continue to the end of the line at Nation, 8 stations later. As the train limped past the next station, Couronnes, its stationmaster was justifiably alarmed at the obvious signs of fire. By the time train 48 arrived there with its triple load of passengers, eddying smoke was visible in the tunnel ahead. Rather than pulling forward to the station exit as usual, the driver stopped his short train halfway along the platform to consult with the stationmaster. With the danger finally understood, the decision was made to evacuate to the street—but by now the passengers, some of them having already been ejected from two trains, were becoming uncooperative. A fare refund was demanded, a lively altercation ensued, and then suddenly it was too late. 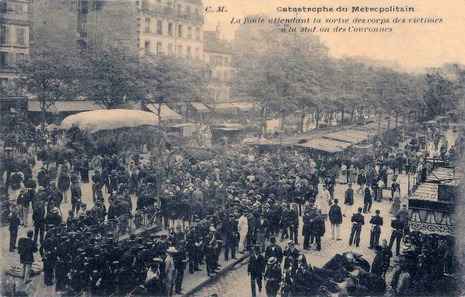 Train 43 had barely reached the next station, Ménilmontant, when the fire grew out of control and the crew fled for their lives. Power was cut at the nearest substation, but since the line was not divided into electrically isolated sections, the shorted motor was still receiving power from other substations. At about 8 p.m. the fire destroyed the one circuit supplying the station lighting. Couronnes station was plunged into darkness just as a dense, choking cloud of smoke emerged from the tunnel leading to Ménilmontant. In less than a minute, the station had become a death trap. Disoriented by the smoke and far from the exit, many people wandered the wrong way until they succumbed to asphyxia. In all, 84 people were killed: 75 at Couronnes, seven at Ménilmontant, and two who tried to escape through the tunnel. The wooden-bodied train burnt down to the level of its chassis. The total number of deaths in last night's disaster on the underground road of the Metropolitan Electric Railway is not yet certain, but it is estimated that there were over 100. Eighty-four bodies have been recovered. Most of the victims were not burned to death, as at first rumored, but were suffocated by the tremendous masses of smoke from the burning trains while they were trying to escape. Mute evidence of the panic which must have taken place in the smoke-filled and unlighted tunnel is given in the discovery of a mass of bodies at an angle of the passage. The victims evidently all struggled there in the dark until all were suffocated.